Huge Savings Item! 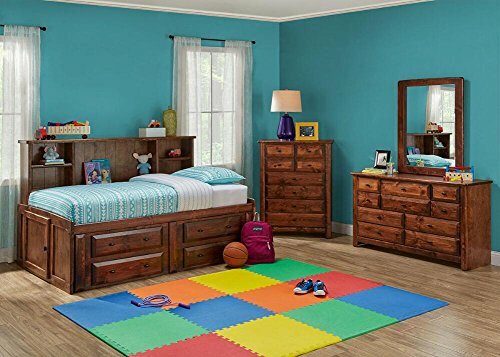 Save 19% on the Catalina Chestnut 6 Pc. Twin Roomsaver Bedroom Furniture Set by THE ROOMPLACE at Indsight. MPN: 825917442. Hurry! Limited time offer. Offer valid only while supplies last. Our Catalina roomsaver six-piece collection expands your child's bedroom with a space-conscious contemporary styled twin captain's bed with storage. Our Catalina roomsaver six-piece collection expands your child's bedroom with a space-conscious contemporary styled twin captain's bed with storage. The roomsaver headboard, which runs the length of the bed offers a room extra space with unique styling while providing shelving space for books, alarm clock, nightlight and framed photos. The piece comes in a chestnut stain and features four drawers located underneath the bed that are perfect for keeping spare blankets, pillows and sweatshirts. The space saving doesn't end with the bed; the dresser features a deep middle drawer for heavy fabrics like jeans or sweaters as well as a mirror to check out those trendy looks before school or play. Functional and fashionable, this bed is sure to be a space-saver. The bedroom suite includes twin roomsaver bed, dresser, mirror and nightstand. Catalina Chestnut 6 Pc. Twin Roomsaver Bedroom Furniture Set. View More In Bedroom Sets. If you have any questions about this product by THE ROOMPLACE, contact us by completing and submitting the form below. If you are looking for a specif part number, please include it with your message.